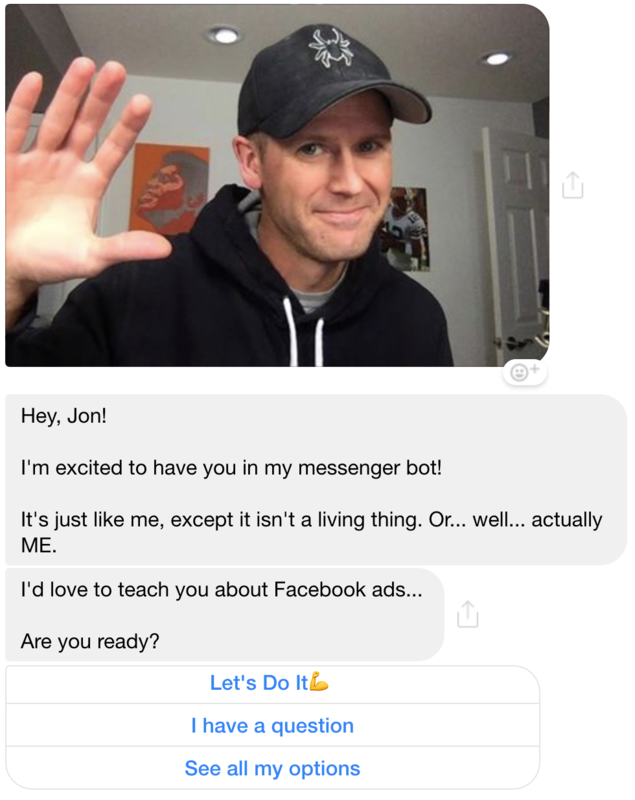 During the past year, I experimented with a Facebook Messenger bot. Last week, I turned it off. This isn’t meant to be an indictment on Facebook Messenger bots. My goal isn’t to convince you that they aren’t valuable. I simply wanted to share my experiences with it and why I ultimately decided to pull the plug. There are plenty of good reasons to have your own bot. You will have no problem finding examples of success stories of brands using them in productive and even profitable ways. But there are potential pitfalls that you need to be prepared for. Messenger bots can be great. I’m sure they can be great for me, too. The reality is that I was not ready. There will likely come a day when a bot makes sense for me. But that day is not today. Have a question about Facebook ads? Just ask it. Of course, those questions would ultimately be answered by me or my staff, not by the bot. And that lack of immediacy could be confusing. More on that later. 2. Subscribe to Quick Video Tutorials. Late last year, I started a series of 30-60 second video tutorials. While everything beyond #50 would only be available to my Power Hitters Club members, I would leverage those first 50 within my bot. Subscribe, and I’d send you a different video every couple of days. Beyond subscribing to these videos, you could also subscribe to my blog without providing an email address. Every time I published a new blog post, I’d send a Messenger broadcast to those subscribed with a link. 4. Learn about my products. Links and info to my training products and private communities. And if you had questions, a member of my team could answer them. One of the reasons I started using a bot in the first place was because of the reports I heard regarding open and engagement rates. Better than email. Way better than email. Well, the final month of broadcasts would go out to close to 6,000 people in all (not unique, just from all broadcasts). Those messages would be opened (or “read”) by over 50% of those users. Sounds amazing. Anyone who can get a 50% open rate on email would be absolutely pumped. But if you’re like me, an “open” Messenger message doesn’t necessarily mean you read it. The click rate would be about 2.8%. Maybe not horrendous, but when you’re only getting about 165 total clicks over an entire month, that’s not saying much. When I first started using my bot a year ago, it was $4 per month. Back then, these kinds of numbers would be fun! But as my subscriptions increased, so did my costs. By the end, I was spending $375 per month. So, I’m sure you can start to see why I turned my bot off. I spent more than $2 per bot click. Fun times. By comparison, I spent about $400 for Infusionsoft last month. My list is, not surprisingly, much larger than what I was handling with my bot. I received close to 10,000 clicks from my email campaigns during the month of October. So, I was spending $2.23 per click for my bot broadcasts and $.04 per click for my email broadcasts. And my email campaigns routinely lead to revenue. This is partly my fault. Bots aren’t my style. At least the way mine was set up. Mine was based on a template, and I made minor tweaks to it. But ultimately, the voice was not mine. And I hated that. But it’s easy for bots to have a high-corny factor. You’re dealing with a “robot,” not an actual person. So you try to give it a personality of its own. My bot made use of a library of auto-replies based on dozens (hundreds?) of messages someone might send. While discovering this may be fun or entertaining at first, it could get extremely frustrating for users as well. The biggest problem when using the bot as a user was deciphering the line between automated bot and actual person. And these auto-responses often led to more trouble than they were worth for their entertainment value. When it comes down to it, this (in addition to the cost) was why my bot was turned off. Some people, once they knew I had a bot, would do all they could to test it. They’d throw every message at it they could think of, trying to break it and test its boundaries. My Facebook page is hooked up to ZenDesk, my customer service ticketing software. Every time someone sent a new message, a new ticket was created or updated. As much as my team dug and tried to find a solution for this, there was none. We had to deal with it. So, I had one staff member sorting through messages, closing everything that didn’t require a response and assigning others to a team member to answer questions. Every time a new broadcast went out, there was a surge in these tickets. Each Monday, I asked my staff how the bot was going. I always sensed that it was an annoyance. That it took way more of their time than it was worth. I didn’t want to turn it off. A few weeks back, I turned off the front facing bot. What that means is that it was still connected to bot software, but messaging my page wouldn’t necessarily trigger a bot conversation. My hope was that this would solve my problems — or at least lessen the drain on my staff. It made little difference. Finally, I pulled the plug entirely. My staff won’t admit it, but I’m sure it was a relief to them. It certainly was for me. All of these things are probably true. I know they work for some. I know that I never bought into and committed to my bot. There is no doubt that there is a way to make my bot work for me. I’ve had numerous people reach out offering to help me create such a bot. But here’s the deal: It’s just not a priority for me. RIGHT NOW. If it’s not a priority, I’m never going to dedicate the amount of time and energy I need to dedicate in order to get the most out of it. And when that happens, the bot quickly becomes a waste of time, money, and resources. Look, I’ll fully admit I hold some skepticism related to bots. I generally hate automation. I think there is a place for it, but this clearly did not work for me. Assuming bot software continues to improve and adoption grows, I’ll connect a bot again one day. But today? I’m relieved mine is dead. Have you experimented with bots, both as a marketer and user? What’s been your experience? 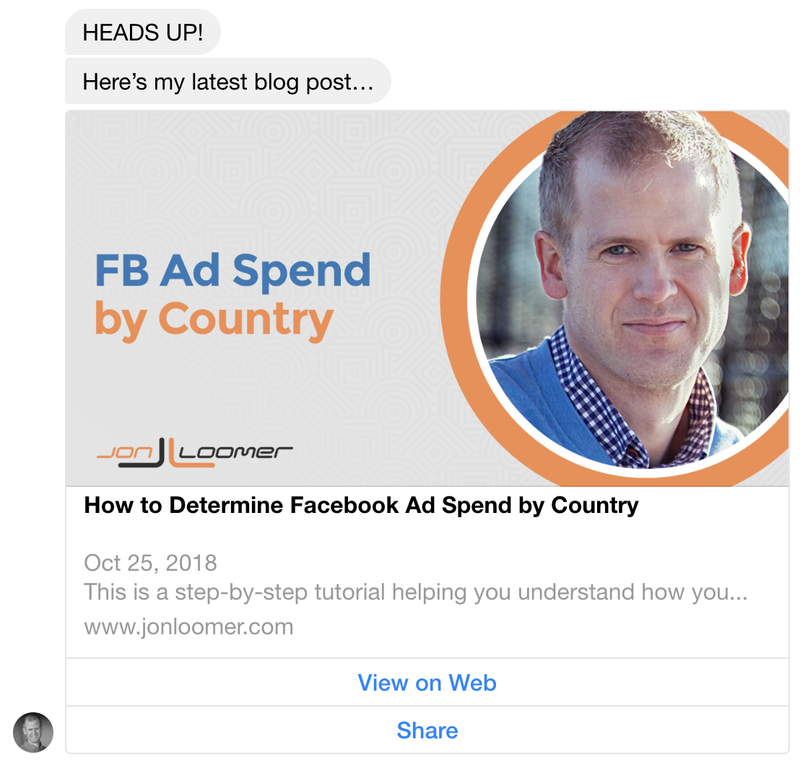 The post Why I Turned Off My Facebook Messenger Bot appeared first on Jon Loomer Digital.